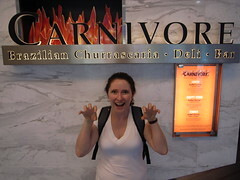 In typical style, the first blog of our one week holiday in Singapore is about food. It's appropriate, as Singaporeans really do love their nosh, and appear to eat anything that crawls, trots, scuttles, swims and even hops. Having said that, so far we have found plenty of vegetarian restaurants, both Indian and Chinese, so Phil has eaten very well so far. I'm mentally drooling over the prospect of Hainanese chicken rice and Singaporean chilli crab, which I'll hopefully get to enjoy sometime in our remaining few days here. Singapore reminds me of the town of Duloc in the movie Shrek, especially the Singaporean leisure island of Sentosa. Everything is clean, artificial and delightfully tacky, even down to the chirpy "Singapore, Singapore!" song that plays at the monorail stations. Government health, safety, anti-terrorism, anti-anti-social behaviour etc etc ads far outweigh any other advertising. It feels like Singaporeans can't even scratch their own behinds without government sanction. The shopping is mental. Talk about a temple to consumerism - only Hong Kong beats it on the luxury front. Needless to say, Phil has already got a new toy - his buyer's guilt lasted a good half an hour after he bought it, so that should give you some indication as to its price. We are staying in an incredible hotel. Each room is decorated by a different artist and the lobby is full of designer chairs. The swimming pool is directly above the restaurant and there are glass portholes in the floor of the pool so restaurant patrons can get an eyeful of tog-clad bodies. I have already tried blowing blowfish on the glass while in the pool, but couldn't see if there was anyone in the restaurant, so I think my efforts may have been wasted. Anywway, we are having a very relaxing time with lots of walking and eating, and enjoying not thinking about work (or in Phil's case, thinking about work a lot less!) for a while.